Haven't received anything? please contact support@wonderspins.co.uk for assistance. Welcome to the charming gaming world of Wonder Spins! Wonder Spins, a steam-punk inspired theme, is home to all the best gaming providers in the industry including NetEnt, Eyecon and Microgaming! All your favourite and the most popular games are available such as Starburst, Rainbow Riches, Gonzo’s Quest and of course the iconic Fluffy Favourites! 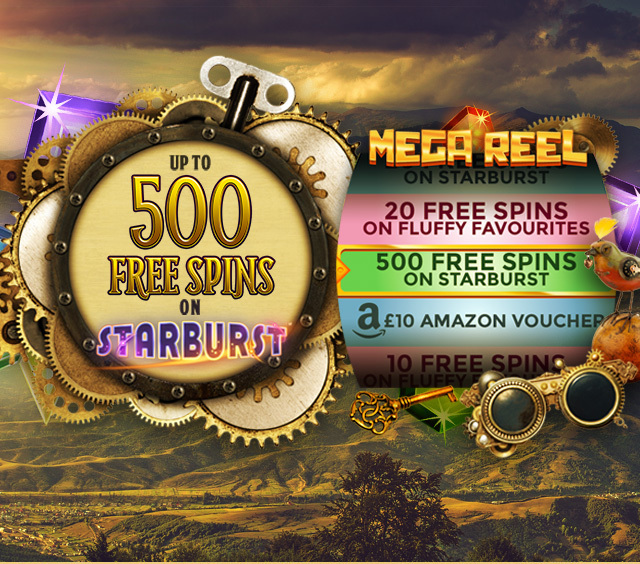 Get your great adventure started and take a spin on the Mega Reel for your chance to win some amazing prizes including Amazon Vouchers, Extra Spins or a massive 500 Starburst Spins*. *New players only, 18+. Min dep £10; £8 max win per 10 spins. Win not guaranteed on Mega Reel. Max bonus conversion £250. 65x wagering requirements apply. Full T&Cs apply. Wonder Spins is operated by Jumpman Gaming Limited which is licensed by the UK Gambling Commission ('UKGC') for customers in Great Britain and the Alderney Gambling Control Commission ('AGCC') for customers outside of Great Britain. All games on Wonder Spins are regulated by the UKGC or both the UKGC and AGCC. Registered business address (no correspondence): Inchalla, Le Val, GY9 3UL, Alderney.